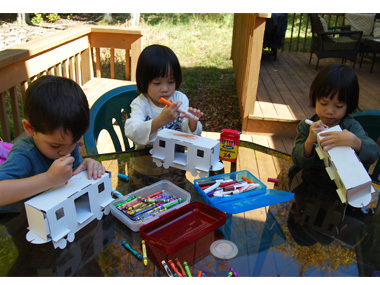 Use markers or crayons to draw a design on the reverse side of the train. Create a design that shows a train that is crowded, busy, or loud. Encourage your child to use different colors and types of lines such as straight, curved, or zigzag. Develop manipulation and counting skills while exploring basic concepts. Help your child count ten to fifteen cityscape pieces. Put the pieces together to create a structure that is tall, wide, big, or slim. Color the reverse side of the butterfly with bright, vibrant colors. Develop your child's motor skills by encouraging them to use different types of strokes such as long, broad strokes or short quick strokes.